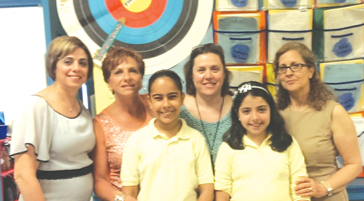 Principal Margarita Hernandez of Wilson Avenue School and her administration proudly congratulate Beatriz Barbosa-Lima and Anna Luiza Fiuza from Wilson Ave School. The two 4th graders won 1st place in the Newark Public Schools’ 35th Annual Multilingual Spelling Bee. Beatriz won 1st place for the Portuguese competition and Anna Luiza tied for 1st place in the English competition. The Newark Museum played host once again to the District competition, May 28 through May 30. Both students, as well as their parents and teachers were congratulated by all. Beatriz and Anna Luiza are both students of Ms. Teresa Reis, Ms. Gail Scriffiano and Ms. Maria Salvador.